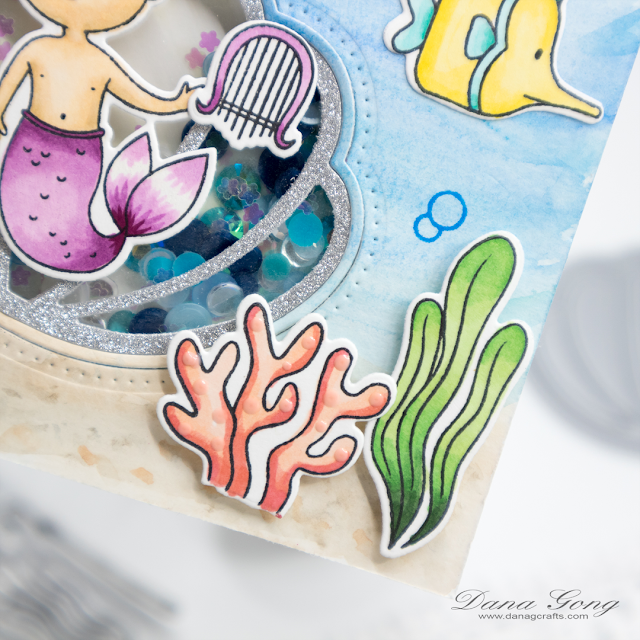 It's Dana here from Dana G.Crafts and I'm so happy to be guesting for BRI blog today with under the sea themed card. For today's card, I started by stamping cute images from Studio Katia Under the Sea Stamp Set and Mermaid For Each Other Stamp Set with MFT Extreme Black Hybrid Ink. I colored them with alcohol markers and die cut all pieces using each coordinating die set. Next, I pulled out cold pressed watercolor paper and watercolored it with Gansai Tambi Watercolor 36 Color Set for background. 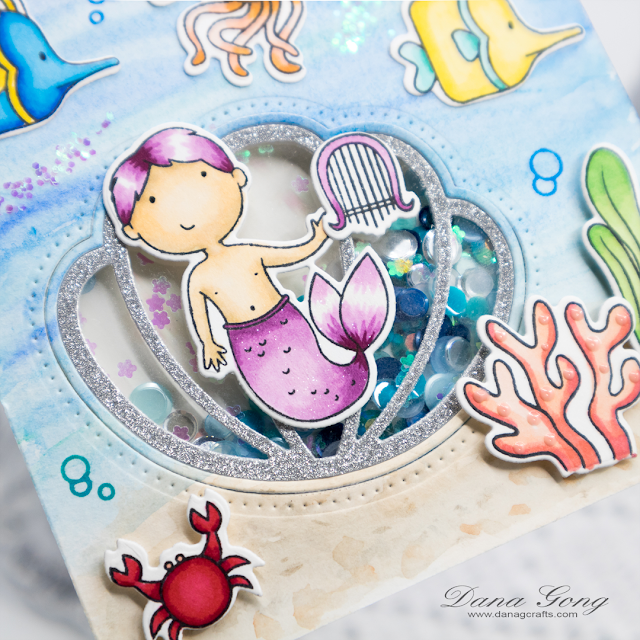 Then, I die cut shaker window using Studio Katia Seashell Shaker from watercolor panel and a piece of silver glitter paper. 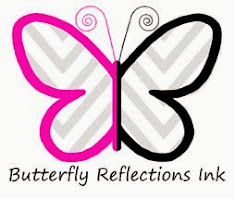 I adhered clear acetate behind the shaker window and mounted silver glitter frame as shown. I then built a shaker using foam adhesive. For shaker elements, I mixed Studio Katia Sparkling Sea Confetti, March Crystals, Flowers Chunky Confetti Glitter. 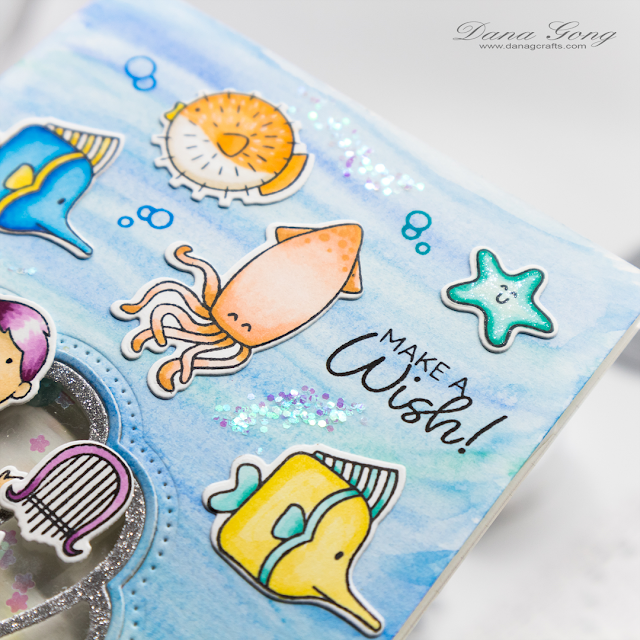 After I finished a shaker, I stamped sentiment from Studio Katia Birthday Greetings Stamp Set and mounted all colored pieces using glue tape and foam adhesive as shown in the picture. I also stamped tiny bubbles from Studio Katia Under the Sea Stamp Set with Salty Ocean and Peacock Feather Distress Oxide Inks. 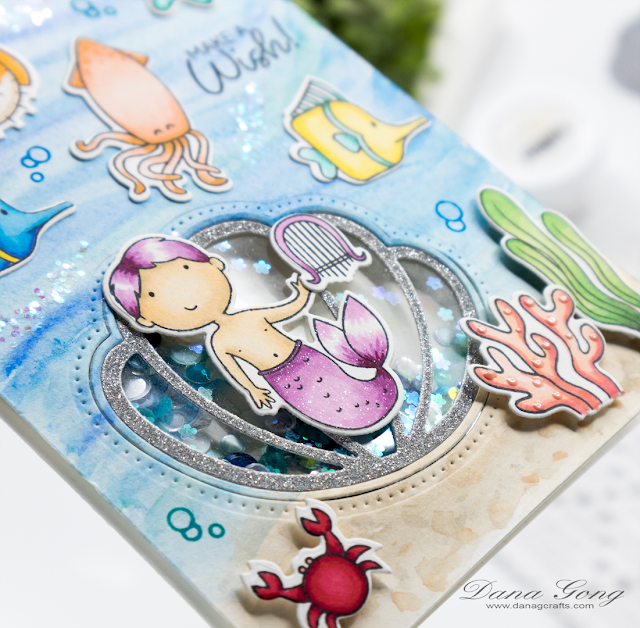 To finish, I adhered sparkling details to mermaid taile and starfish using Spectrum Noir Sprakle Pen, sea background using Studio Katia Just Chuncky Confetti Glitter and Ranger Multi Medium Matte.